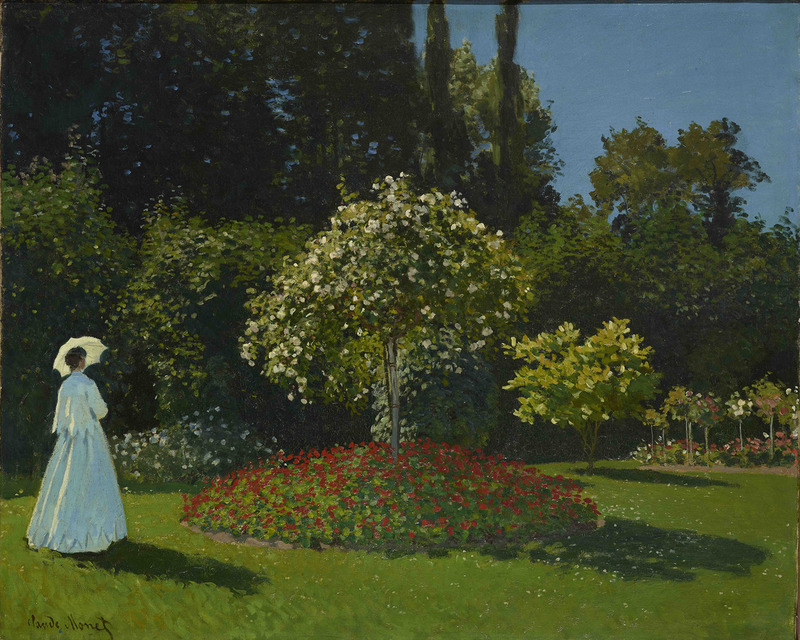 The Royal Academy’s ‘Painting the Modern Garden: Monet to Matisse’, begins and ends with Monet; Matisse barely appears, perhaps included in the title purely for alliterative effect. 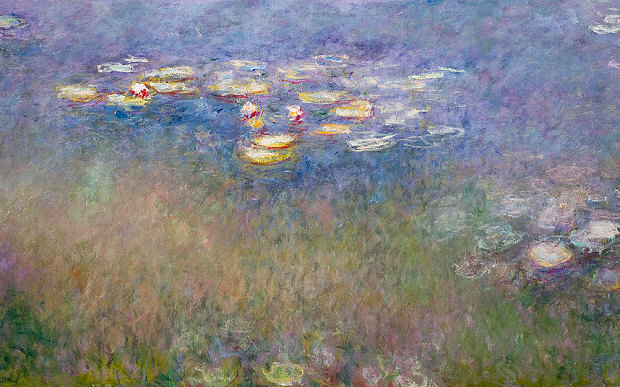 Monet provides the constant touchstone running through this beautiful exhibition, and it is a joy to see the development both of his painting style and his gardens from the 1860s – on the cusp of Impressionism – to the majestic waterlilies of his final years. The RA has brought together a fascinating range of lesser known canvases (many from private collections and American museums) that are the more interesting for not all being ‘masterpieces’. There is ‘Lady in the Garden’ (above, 1867), a smaller and simpler version of the Musee d’Orsay’s magisterial ‘Women in the Garden’; and then there is the comparatively garish scene of the artist’s children dwarfed by hordes of sunflowers of 1880. 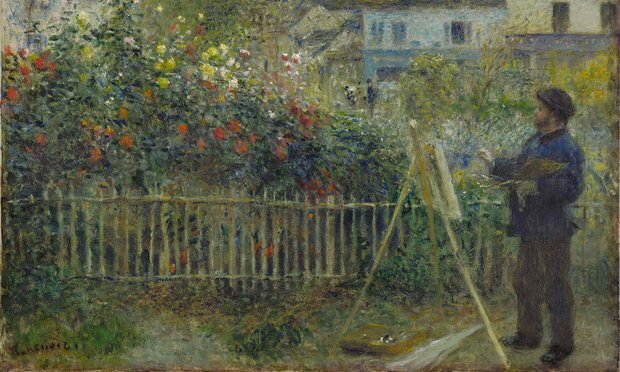 ‘The Artist’s Garden at Argenteuil’ (1873) and Renoir’s almost identical view with Monet at his easel (above right) contrast with the early flower studies by these artists and illustrate the rapid – and t0 many unsettling – development towards Impressionism. The gap between these two pairs of paintings was filled, in historical terms, by the Franco-Prussian war and the Paris Commune. 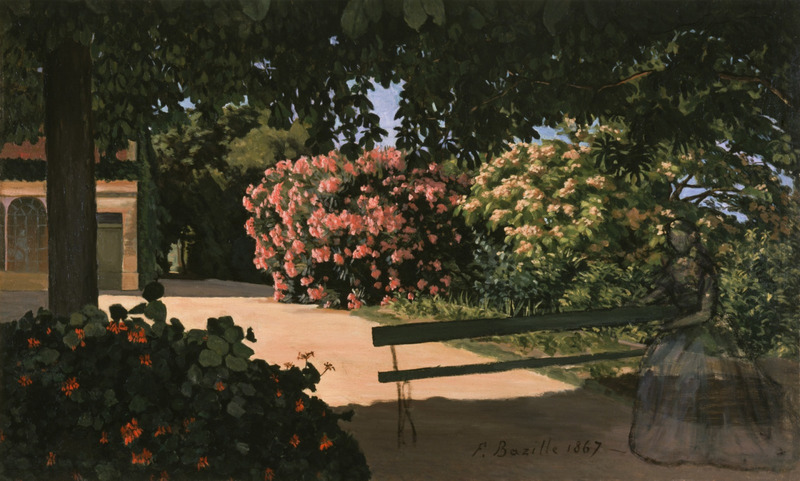 Frederic Bazille, killed in this conflict, is an often forgotten contemporary of the early Impressionists. The ghostly figure in his sunlit garden scene ‘Les Lauriers roses (The Terrace at Méric)’ (above, 1867) is a poignant reminder of a career cut short. 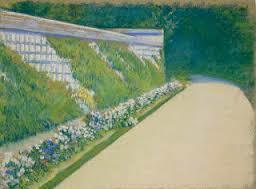 It is also good to see more of Caillebotte, a more precise Impressionist whose passion for gardening is clear in the most believable of many painted nasturtiums (left, 1892), and in ‘The Wall of the Vegetable Garden, Yerres’ (below right), a view that would be chosen by none but a gardener. 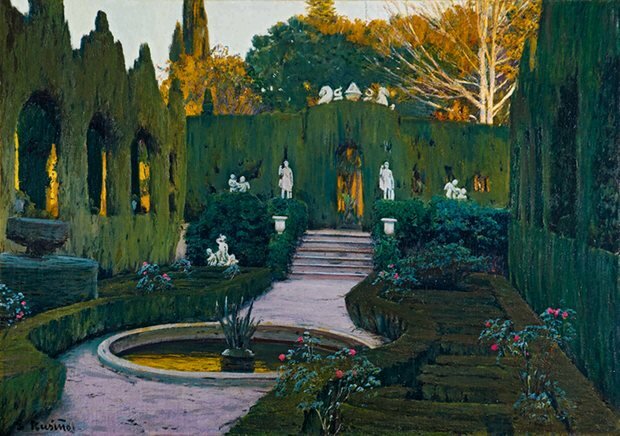 Then the exhibition opens out to embrace a host of international artists, including several I didn’t know such as Joaquin Sorolla and Laurits Tuxen, and others whose paintings of gardens were new to me. 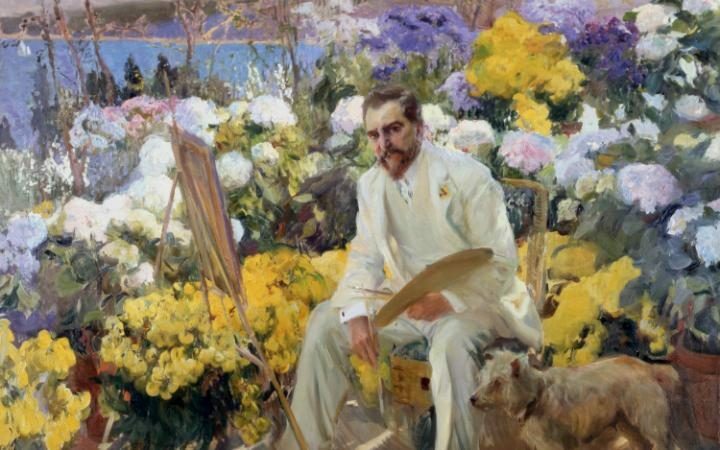 Sorolla’s portrait of Louis Comfort Tiffany (below right, 1911) surrounded by a an explosion of blooms is a floral highlight, while Singer Sargent is represented by numerous lilies from the same period as ‘Carnation Lily Lily Rose’ (though the absence of this piece is not quite compensated by ‘Garden Study of the Vickers Children’). The RA must have relished the garden theme as an opportunity for a theatrical approach with the ‘atrium’ construction in the second gallery and the ‘greenhouse’ effect display cabinets. The garden benches I could live with but for the rest I would have preferred the gallery walls to be used to their full glory, to see the painted geraniums tumbling from above, the lilies below, the canvases clustered as they would have been at a Paris Salon in very similar rooms to these in the late 19th century. The ‘Avant-Gardens’ gallery (I forgave the pun) is an odd mixture, though successful in highlighting the many diverse directions taken by artists in the early years of the 20th century. Some could have been better represented – Matisse particularly, and from all Van Gogh’s sinuous irises and flowering cherry blossom a strangely static and formal Auvers garden scene has been chosen. 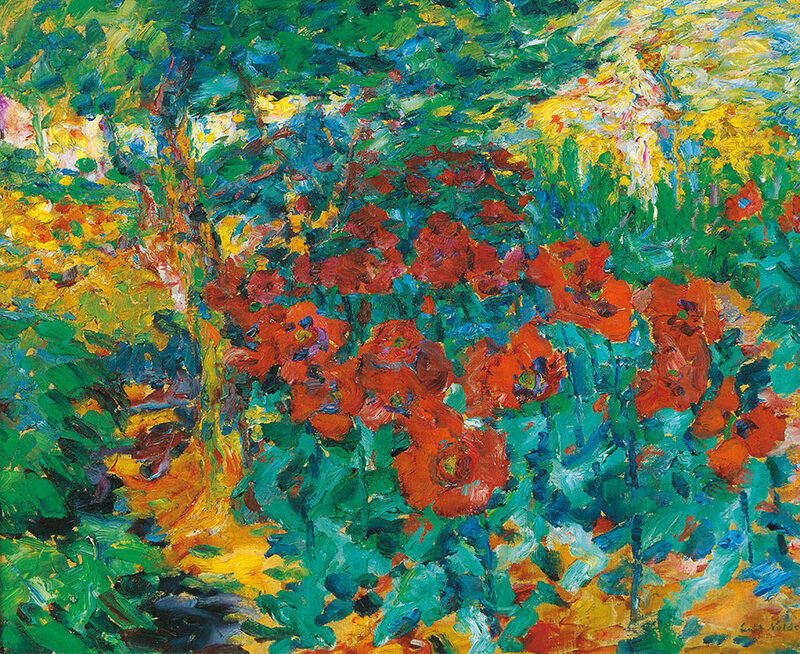 Nonetheless there was a glorious selection, with Klimt’s mosaic of leaves and flowers (above left), Kandinsky’s Murnau garden of 1910, Munch’s glowering, biblical apple tree in pure blue, green and yellow, and Emil Nolde’s thickly impasto poppies (below right, 1908). 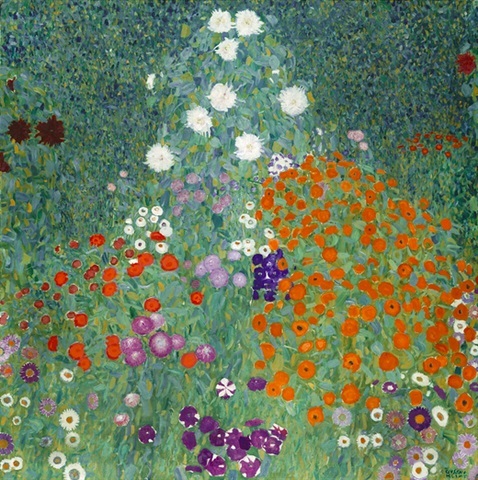 Meanwhile it was a pleasant surprise to find lesser known (and difficult to classify) artists such as Henri Le Sidaner and Santiago Rusinol represented so well, their canvases facing one another across the subsequent gallery, the one crepuscular (‘Steps, Gerberoy’, 1902, below), the other drenched in Spanish sunlight (‘Gardens of Monforte’, 1917, below). 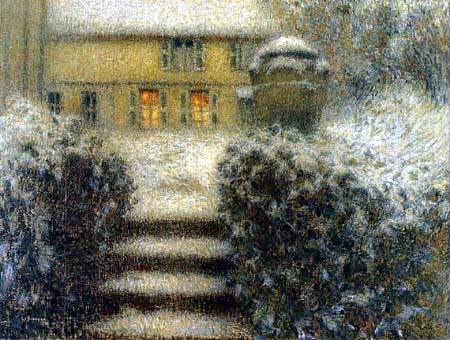 Both artists had inherited the Impressionist interest in atmospheric light effects, but rejected other elements of the creed; Le Sidaner, if anything preferred the term ‘Intimiste’ while Rusinol rejected the broken brushstrokes of Impressionism, preferring to maintain the solidness of objects. 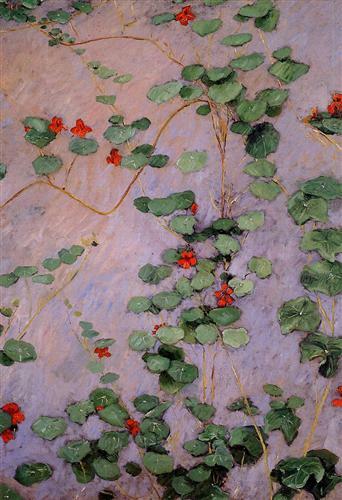 Similarly, the Nabis painters Bonnard and Vuillard worked from memory and sketches rather than completing their work en plein air and adopted the Fauve technique that gives blank canvas a positive role in the composition. A whole gallery is given over to large scale works by these two artists, including Vuillard’s two panel ‘The Garden of Le Relais at Villeneuve-sur-Yonne’ (1898). 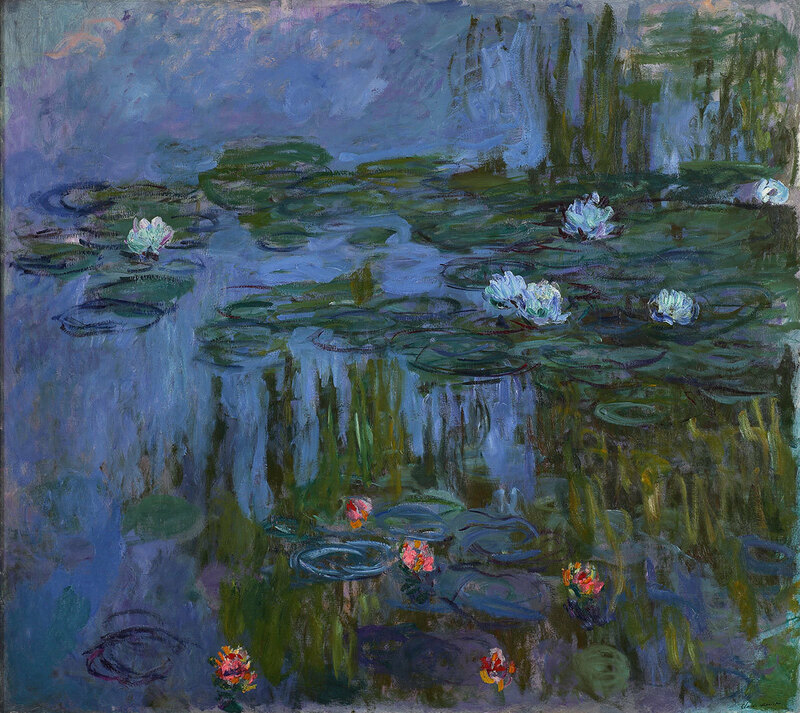 Then, swiftly, as if with relief, the narrative returned to Monet, with two rooms full of waterlilies and weeping willow (above, 1914-15), sensuous and contemplative, allowing the eye to melt into the deep pigments, the reflections and stillness. The final Agapanthus triptych (part below, 1916-19) was a the culmination of this period and – reunited for the first time in Europe since it was painted – a suitably climactic finale.